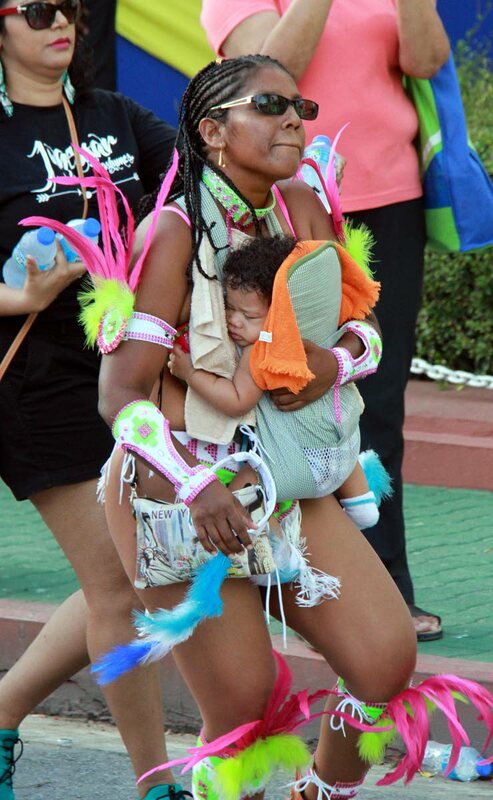 HAVING A GOOD TIME: This woman is seen playing mas in San Fernando on Carnival Monday with a baby strapped to her chest. She was warned by police and band officials to give the baby to someone else. SOCIAL media was abuzz yesterday, mainly with condemnation, after photos and videos were uploaded showing a woman dancing and prancing on the road in San Fernando on Carnival Monday, with a baby strapped to her chest. Even the Children’s Authority weighed in on the incident, praising a police officer for warning the reveller to desist from playing mas while holding the baby. The authority said such behaviour could expose a baby to physical and emotional trauma. The mother, playing in Lionel Jagessar’s band with her baby asleep against her bosom, was at the time crossing the judging point on Harris Promenade, when a woman police officer walked up to her. The officer told the mother to give the child to someone else to hold. In a statement yesterday, the authority stated that the officer should be commended for instituting the law in accordance with the Children’s Act. Lionel Jagessar Jr, contacted for comment, told Newsday that his parents also spotted the woman and warned her against carrying the baby while parading in full costume. Communications manager at the Children’s Authority, Cheryl Moses-Williams, stated: “The Children’s Authority is in high praise of the woman police officer who cautioned a mother for carrying her young child in her arms while she paraded in a band on Carnival Monday. The Authority reminds parents and guardians that the safety and well-being of their child should be their first priority. “In fact the Children Act 2012 clearly states that a person who wilfully exposes a child in a manner likely to cause that child’s suffering or injury to his/her physical, mental or emotional health, commits the offence of cruelty to a child.” The baby appeared to be mere months old. Moses reminded that the Children’s Act states that a person who so exposes a child, could be liable to a fine of $5,000 and/or imprisonment for six years. A $50,000 fine could be imposed in the case of a repeat offender, or ten years in jail. Reply to "Blows for dancing mom"